I have decided not to leave. Yesterday, I was eating a drippy peach we’d bought from one of those roadside stands that have baskets of homegrown stuff and instruct you to leave your money in a little container (you know, just like in Manhattan!) over the sink and two tiny deer and a bunny appeared in the woodsy area next to our house and seriously, I cannot believe that people own these places and willingly rent them to strangers. Where else could they possibly want to stay? Here, there are small beaches where you are frequently the only person on them. Seagulls caw and while I’m sure they’re saying, “Over here! There’s a chubby baby boy napping and he looks very tasty!” I like them anyway. There are enough wineries that if you tried to hit two a day for a week, you wouldn’t get to all of them (but you should try, anyway) and every farm stand brags about their blackberries. There’s an old-fashioned chocolate shop with an actual old-fashioned looking guy in the next room, making your daily dose of dark chocolate turtles. We’ve passed something called a Farm Preschool which I’ve decided I’ll attend instead of the baby because why should he have all the fun? I’m reading a book I was sure I’d find unendurable and actually liking it (though likely because I’m still on the part about the eatin’). And there are 7-11’s all over this town. If I have accidentally given off the impression that I was cool growing up, let me set it straight right here: my idea of a good time was going to 7-11 with my friends and getting Slurpees. Sometimes we’d take them out to the beach and play Skee-Ball on the boardwalk, exchanging a wad of winning tickets for useless junk that we’d find in the back of a car years later, sometimes we’d idle in the parking lot until the owners frowned at us, but always, there were Slurpees. I only drank mine in cherry, because that’s what Veronica did in Heathers, but I’d settle for any flavor that came in that neon red color that made me look like a little kid that had gotten into her mother’s lipstick again. I never once thought about recreating my own at home until we were cleaning out the fridge (or trying to) on the Friday before we left and I saw that I had a half-pint of raspberries and a cup of freshly-squeezed lime juice that’d I’d been saving… for that day, clearly. I’m pretty sure people have been trying to sell me on the raspberry-lime combination for years but I’d never actually crashed them into each other until that day in my blender and hot damn people, that was a huge mistake. I cannot get over how made for each other these two flavors are, blended with sugar, ice and well, honestly, a little too much water. I was kind of making it up as a I went along and didn’t exactly achieve perfectly emulsified Slurpeedom but we could not care. It has been well over a decade since anything both frozen and fizzy tasted that good. * For those of you in woeful 7-11 free places, Slurpees are a no doubt horrid HFCS-laden concoction of super-sweet brightly-colored soda and slushy ice that came forth from knobs so powerfully that only regulars knew how to get that all in your overly-large plastic domed cup. I’ve got mad skills, is what I’m trying to say here. 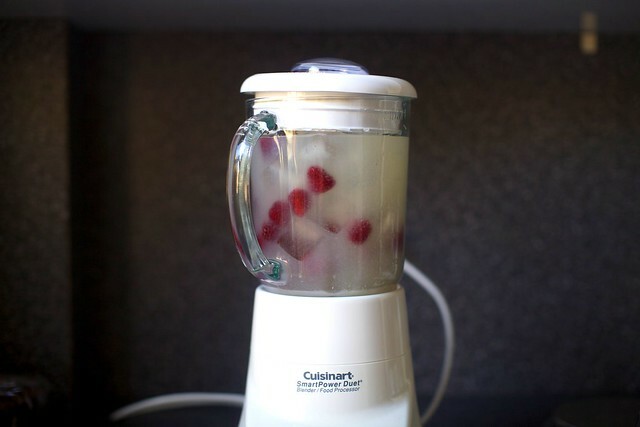 In a blender, blend the lime juice, raspberries, water, ice and sugar until slushy. Pour into glasses. Top off with about 1/4 cup soda water and garnish with a lime wedge. Drink quickly enough to get a brain freeze. If you’re averse to raspberry seeds (I generally am, but was feeling rushed that day), you can puree the berries first, press them through a fine-mesh strainer to remove the seeds, then put them back in the blender and add the rest of the ingredients. I will note that the seeds were far less annoying than I’d expected them to be, likely because they’re less noticeable with the added texture from the ice. Also: I probably don’t need to tell you how good this would be with booze. I’d love to be on a beach (or at least have one near me!) and be the only person… what a relaxing idea! These sound so refreshing and fabulous. I can’t resist… seems so refreshing!! Thanks for sharing! How delicious! I am feeling a little naughty, so I would be inclined to add a shot of rum in there! Oh dear this looks right up my alley. 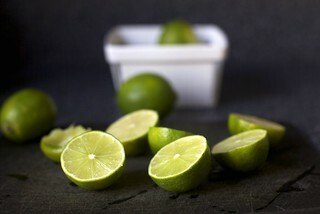 Anything with lime seems to tickle my fancy these days. Yum. Wowza. With booze it is. I’m about to head back to school and this sounds like an ideal “last night of freedom” situation. Love the blog–keep living it up on vacation! Great looking limeade. 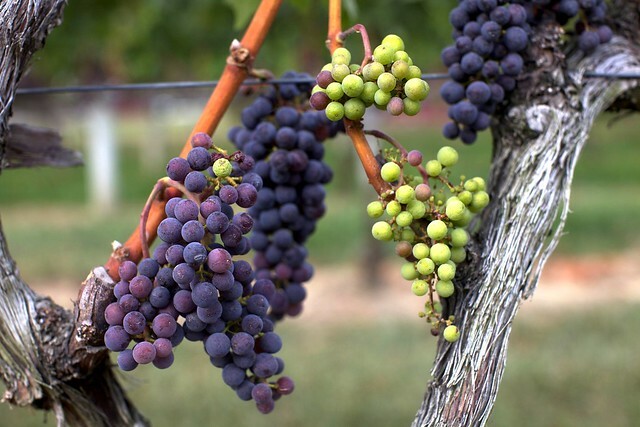 Loved the picture of the grapes on a vine. On July 11th (7-11) they give away free slurpees! Did you know that? I didn’t until this past 7-11 when I rushed down to the nearest 7-11 and got myself a mixed coca-cola and cherry–it was like fourth grade all over again. There’s a lip balm by Nivea that gives you that perfect tint of slurpee pink/red. It looks like I just downed a slurpee at all times. These look great! I am in the middle of planning a baby shower and these would be perfect :) Thanks! I am headed to buy limes right now! If you are like me, you will finish the book and declare it should have been titled “Eat, Eat, Eat”. Hah! I loved slurpees in high school too. Half coke, half cherry please. Love that last little note. Will add tequila and report back! Oooh, I used to love Slurpees as a kid! I thought I’d hate the book too, and boycotted it forever, but eventually was persuaded to take a peek and lo and behold, I actually adored her writing! My recommendation would be to take in every bite of section 1, skim section 2, and head straight to Bali as soon as you can. PS- Made your chocolate peanut butter cake, peach cupcakes and blondies (with banana and chocolate chips) for my boyfriend’s birthday party this weekend, and they were all huge hits! PPS- Just to make this post-related, the slushies look super refreshing and remind me of my younger days in the suburbs too. sparkling wine instead of soda water, mmmaybe? Love the Heathers reference! I always use my citrus press the other way around though… (Like shown here: http://mashenahope.blogspot.com/2008/11/favorite-things-lemon-lime-press.html) I’m sure it works fine both ways, just thought it was interesting! Citrus press — Every single time I show a photo with it, I get a slew of emails and comments worried that I’m using it wrong. It always amuses me, the level of concern! It’s very sweet. Anyway, rest assured, I use it “correctly”. Then I flip the citrus half around and squeeze it the other way to get even more juice out of it. You all should try it! It physically pains me to think that any juice might go un-squeezed. Just what I need for the long hot summer day! You’re amazing. This looks unbelievably tasty. I’m getting the ingredients for this tomorrow. Also, that book is fantastic. This looks ridiculously refreshing…perfect on a hot day! The lime and raspberry combination sounds really good!! Yum! Sound like you had a great time. Quick typo check at the very end: “…how good this would be would booze.” Is the second ‘would’ supposed to be a ‘with’? I can’t tell you how much I want to have this right now. Fantastic. Oh goodness, that sounds so good right now. where are you vacationing this time? I seem to have missed your destination! Hah, I’m reading that too and had the exact same reaction. Wow! I don’t think ANYTHING goes together better than raspberries and limes! *getting out the blender now… and looking for the booze* :) Also – I LOVE the berry baskets… super cute! I just made a very similar limeade with Melon and Ginger syrup. I love those simple fruit drinks, just delicious. I had to chuckle at your comment about “the book” and how you were sure you enjoyed it b/c you are still on the food part. I’m in the pray part now, and it’s still good; however, there’s nothing like reading about eating your way through Italy. the photography is just so rich in color …breathtaking! I am so unbelievably jealous right now. I would do just about anything to get out of this 7-11 laden metropolitan. LA in the summer is touristy, unbearably hot, humid hell. I suppose this recipe will have to do for now. these photos are your best yet! i LOVE the produce shots! Pass me the vodka and I think we have a party. In my neck o’ the woods, they were called Icees, and the best was always cherry (although the neon blue was strangely tasty, too). Our moms gave us quarters and permission to cross the big road if we promised to look both ways twice, and we’d get our icees and play jacks on the sidewalk in front of the store. I know vodka would totally work with this, but I’m gonna go for the tequila. The lime juice is just calling out for it. The slurpee’s look great and a little Tito’s vodka sounds like the perfect addition. I’m mostly enjoying the comments about “the book”. I also just started reading it somewhat hesitantly. I’m headed to Italy for 3 weeks in Oct, so I’ve enjoyed section one. So what is Alex getting for his birthday dessert this year? i was just about to tell you all about how i discovered raspberry lime rickeys when i lived in cambridge, but i see melissa beat me to it. Melissa – ooh, love those (grew up in MA)!! Raspberry and lime = yum! I love quiet idyllic places like that, feels like such an amazing escape and I’m totally jealous of yours! Don’t joke about the seagulls. One attacked Olivia at the zoo when she was about 18 months, trying to get the cheese stick out of her hand. I was trying to grab the f#*#$^er off her, but everytime I got close, he got more aggressive. Actually bit her finger and drew blood. For a cheese stick! It was horrible. I’ve hated them since. I’m am (was) an Icee girl and it had to be red. I loved cherry anything..and, oh, Tiki Punch, the soda and standard beverage at all elementary school birthday parties! On the stoop or on the curb, but never allowed on the house! I love the Heathers reference. All you need is some BBQ corn nuts to accompany this new slurpee and you’re set. This looks amazing, but having used limes in the past, I know that you need a lot of limes to get any significant amount of juice. 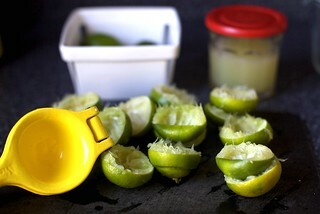 Approximately how many limes are needed to get the 1 cup of juice this recipe calls for? “would be would booze” huh? Looks like you already indulged, and I’m jealous! These look delicious and refreshing!! I can’t wait to make these, thanks for the post! Another book comment: friends would probably tell you that I’m the ideal, target audience for it, but I still haven’t read it. I often have an aversion to books and movies that seem as if they’ll be overly female-targeted, yet aren’t packaged in pink. That may make no sense to anyone but me, but… anyhow. So, no, I haven’t read it yet, but my former local public radio station (WPR, I still love you) ran it as their Chapter-A-Day series a few months ago. It’s lovely: one of the announcers reads one chapter daily of some chosen book. I happened to catch the last one-third of the chapters, and was surprised to find that I really liked it. Then, just tonight, I listened to a recent interview with the author on NPR show On Point with Tom Ashbrook; that was really nice, too. I’ll get around to reading it (and the sequel) at some point, but it’ll be a while… I’m sure that the release of the big-screen version will tie it up at local libraries for a long time. Speaking of the movie, I’ll say this: I was NOT pleased to see that Julia Roberts was chosen for the lead. I feel like we all know exactly how the main character will be portrayed if we’ve seen as few as two Roberts movies. It would’ve been nice for a lesser-known actor to snag the role. As for Icees/Slurpies/Slushees… we had them rarely growing up, but when we did, oh, the rapture! Any color was great for me. And the drink, Deb: isn’t it great to free up fridge space and make something tasty? That always makes me feel triumphant and as if I am the very embodiment of “waste not, want not”. As someone who dreams of living in NYC for a year or two, I’ll bet whoever rented you that place went to the city and is wondering the very same thing you are. “How could these Manhattanites ever want to leave this place? !” The grass is always greener, eh? Do yourself a favour and don’t bother with the ‘Love’ section. It’s painful. mmmmmm Slurpee memories!!! I’ll drink any kind of frozen shlushie type of drink–all thru my pregnancy I was freezing fruit and blending it in the blender…. I’m trying to guess where you are. I don’t think I saw it, but maybe I missed it. Is it Rhode Island??? Sounds like you’re on the east end of LI this week and it sounds like you’re having a fabulous time! I grew up in Patchogue (halfway out on the south shore) and sure do miss those at-least-one-in-every-town 7-11s at this time of year when a Slurpie can make the world right again. Thanks for posting such a great looking (read: healthier) substitute for a long-time favorite! Having grown up in a city so boring that its 7-11s are a true destination for kids and teenagers, I know exactly what you mean. I now live in a gorgeous world-class city with the ocean, the mountains, and forests all within easy access and what do I miss? Being able to walk to the corner store for a Slurpee. I’ll be sure to try this recipe though! There are people who don’t have access to 7-11 or slurpee machines? The horror. I made a similar discovery a couple of summers ago about raspberries and watermelon – blend the two together and make a great juice, or topup with soda water and ice and YUM! I love the combination of raspberries and lime. Two of my favourite things and the photo makes this look so beautiful!!! Ah a grownup slurpee…my idea of one anyway and love raspberry lemonade/limeade. Yep had them as a kid but was not true fan of them as my little brother and now my son. How much “would booze” is with booze? And I want to be where you were, it’s so dang hot around here everything is crispy. The raspberries are just about bending the branches of their bushes to the ground, I can’t wait until they are ready so I can make this drink. I think I can scam about the cup it needs off the plants before my kids get at them. If you havn’t read it all ready.. The School of Essential Ingredients,it is not just about food& ingredients but about the senses and the part food and cooking plays in people’s lives, best book I have read all summer! I love your photographs.. the colors and textures that come across are quite incredable! I don’t know what I love more, that when I randomly decided to check whether you had updated— it was, a recipe that involves raspberries or Jacob’s head of hair! Oh my, that looks yummy! Very very refreshing and cooling slush . You are having a great time and it is infectious…. Eat, Pray, Love is delightful, but I read it just as I was about to get my heart stomped on, so it helped me through that awful period. I think her writing style’s a little like yours – funny, forthright and conversational – so I think you’ll like it all the way through. Just read Eat Pray Love, the found it very amusing and insightful, but the ‘Eat’ section is by far the best! Sounds like you are having a blast and are able to relax. Enjoy! The slushie looks so good and sounds like so much fun to drink. Will have to try this one soon. we went to North Fork last September, stayed in an amazing B&B across from a beach that had millions of heart shaped rocks on it I could not stop picking them up, so I came home with a huge bag of rocks[but they were heart shaped]! Went to tons of wineries and a few amazing Antique stores then took the Ferry to The Hamptons. It was fabulous. Do you rent the same house? We are thinking about going back the beginning of October, for the changing of the leaves…ooops! so sorry I can’t stop sometimes. Glad you had fun! Roadside stands totally remind me of my childhood. We lived not too terribly far from “farm country” in CA and would make trips out there. Oh, I just loved all the fresh fruits and veggies. This slushie looks amazing! Totally refreshing!!! Your photographs are always so great. Could you tell me what kind of camera you use? Those look like the cherry tomatoes at Sang Lee Farms..I have a huge basket sitting in my kitchen because I couldn’t leave a single color of the zillion varieties untasted. did you see their multicolored carrots.??. and radishes. ?.and the tiny little striped zucchini?Blackberry Peach cobbler tonight on Shelter Island..come visit here too. Raspberries and lime-YUM! I am going to make these for my children when we return from vacation. I love the photo of you, Alex and Jacob! You are one adorable family! :-) Have fun in LI! This isn’t your everyday slurpee!! I can only imagine how awesome these would be with rum!! It’s Friday, LIVE IT UP!! Thanks for a great recipe! Looks fantastic! Lovely photo of the fam too! Your vacation sounds amazing. I’ve never tried combining lime and raspberries before either, but this sounds delightful. Thanks for the post! I found a recipe this summer that is the “adult” version of a Slurpee. Lacking fresh raspberries, I used citrus only. (3 fresh lemons, 3 fresh limes, 3 ruby red grapefruit all juiced with pulp, Assam tea steeped in simple syrup, vodka and if you are so inclined, a bit of amaretto–although that was too sweet for me). It requires an extended stay in the freezer, with vodka keeping the mixture slurpable. Freeze overnight, scoop into a glass and fill with seltzer or even just plain old water to get to Slurpee consistency. Maybe this would tide you over in winter when fresh raspberries are unavailable. 2 comments – 1. I LOVED the “eating” part of that book and will confess to skimming parts of the rest. 2. You just reminded me of my youth and of getting Raspberry-Lime Rickey’s at Brighams (Boston area ice cream shop)….now I wish I had picked up raspberries at the grocery store this morning! I’ll take this over 7-Eleven’s version any old day. I’m a lemon/lime kind of girl, so this, with the sweetness of the raspberries sounds so appealing. It sounds like you’re having a ball in that sweet little town. I made raspberry lime sorbet last summer. It was delicious. A perfect combination! Oooh with fresh lime too! I probably would have used that concentrated minute maid limeade garbage. along the same lines, my favorite summer cocktail: the frozen margarita, minus triple sec, plus chambord! yum. It’s 95 degrees in Chicago and I need one of these right now!!! YUMMY!! This sounds like liquid gold to me…summer has returned to Seattle so I’m going to celebrate by making me a Slurpee…the Coke Slurpee was always my fav – and I continue to buy them at the 7-11 that is 7.7 miles from my house! i’m a sucker for raspberries and -ades! this must be so tasty! Oh how I loved Slurpees, I would mix Coke flavor and the cherry, for a Cherry-Coke Slurpee.Brings back memories! 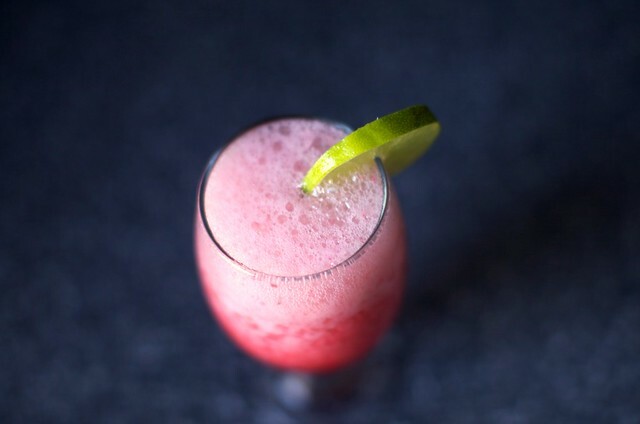 I love this more “grown-up” raspberry lime recipe. Definitely going to have one of these during our 104 degree days! I’ve been making lots of raspberry lime things this summer. Granita is almost like a grown up slurpee all on its own, especially as it starts to thaw in a slushy mass. Oh Slurpees! We loved. Wait, we still love. Shoot. But your version looks a million times more delicious and chemical free. Hurrah! And yes, we’re definitely going to turn this into a cocktail…! we all know that chubby boys are THE tastiest! Oh dear. That looks fantastic! Remember when they came out with Coke slushies? We thought we were really innovative when we mixed it with the cherry flavor. I made a slushy a few weeks ago involving watermelon and lime and let me just tell you, tequila has never been happier! I hope you stopped at the Briermere farm stand! It is my favorite on the North Fork. The pies are out of this world! Best cherry pie I’ve ever had. Nadette @ Eat, Read, Rant! i have lemons and raspberries in my fridge but no blender. somehow, i’ll make it work! Veronica in Heathers. Wow, great reference. Must go put that in the Netflix queue immediately. I will definitely be sipping these grownup slurpees while I watch it! As great as these sound…consider sometime adding just a bit of cava or prosecco (no need to pop for pricey champagne if mixing with a fruit blend). Ahh…now the same delightful flavors but an adult beverage! I’ve done it; it’s good! It’s over 100º here in Missouri today, so yes, these will be happening. With booze. Wonderful recipe, and amazing images! You need to teach a food photo class if you have not done so already! Hey Deb, I had a dream the other night about you and your family… and you had TWO babies. (That’s what I get for reading SK right before bed). You fed me a delicious meal, but I really just wanted to play with your TWO babies. Um… I wasn’t sure I could love you any more than I already do but that Heathers reference definitely means we are soul sisters!!! Oh Slurpees! So happy to hear y’all are having a blast at the beach. And a loud yes to Farm Preschool! These slushies look amazing…will be making them this weekend…with the alocohol option of course!! Im obsessed with your blog and am so happy you got back to the north fork…im a north fork native and i couldn’t imagine living anywhere else! Saw on your last trip you made it to a number of vineyards (im a regular at peconic bay vineyard haha) as well as what we call “the table” (north fork table), hope this time was just as enjoyable!! Glad you love it so much!! What are your thoughts on using frozen raspberries? I love the Heathers reference! I might have to watch the movie and make your slushy. Thanks for the inspiration! I hate 7-11. They had crystal light slurpees so I could indulge my passion for things cold, wet, sparkly and sweet and now they don’t. I could probably justify the sugar in the lime juice and berries but do you thing this would work with sweetener? You are too funny and then you give us a knock-your-socks-off slurpee to boot? Shameless! PS – I’d never leave that fantastical place either. You go. I was just thinking some vodka would be excellent with this. You could whip them up and then throw in the freezer (the vodka will make sure it doesn’t freeze all the way through). YUM!! happy birthday to alex…was claudia fleming baking the night you celebrated? This slushy looks so good! And I must admit… I’m surprised you didn’t add alcohol to it! Slurpees are my one vice…….I have four 7-11’s in a mile radius near my house. Will have to try the homemade version though, Yummy. Yum! So refreshing! I bet this would be awesome with blackberries too. ooh…. I hate to say this, but just looking at this gives me a brain freeze! I want to like them, but oh, the pain! I once dated a guy who didn’t understand brain freeze at all — he could absolutely inhale freezing stuff, while i was taking one tiny bite at a time, and letting it melt completely before I swallowed. Obviously, this relationship was doomed…. I couldn’t help but notice your photo of the gorgeous mini tomato cuteness. And do you know what I discovered tonight while making yummy food for a wedding? Currant Tomatoes. They are ripe, teeny, eeny, meeny, micro, sub-Jacob-sized little bursts of awesome. And I just thought you needed to know about them. So where is this vacation spot? Looks like the East coast? Looks like the perfect vacation cool-off beverage… though I’m in the camp with those who would add rum ;-) Super cute family pic!! This looks so amazing. I wonder how it would be with the addition of elderflower syrup? Mmmm. BTW, your writing is wonderful. Oh my, used to walk home from high school (avoiding the usual 2 mile bus ride) just so I could go to 7-11 for a slurpy. Then one day I had serious brain-freeze that caused pain in my back that I thought would kill me! Gave them up! Tried to re-surge the idea when frozen drinks became the rage, just never enjoyed them as much as everyone else. My Mom used to make limeade and add in raspberries, I used to mush them in my glass. I’m sure your recipe is much better and will be making it this weekend for sure! I completely adore everything about this post – thank you! I live in a wonderful suburb, and people in my neighborhood have card tables covered with foam trays full of tomatoes, plastic bags and a coffee can. 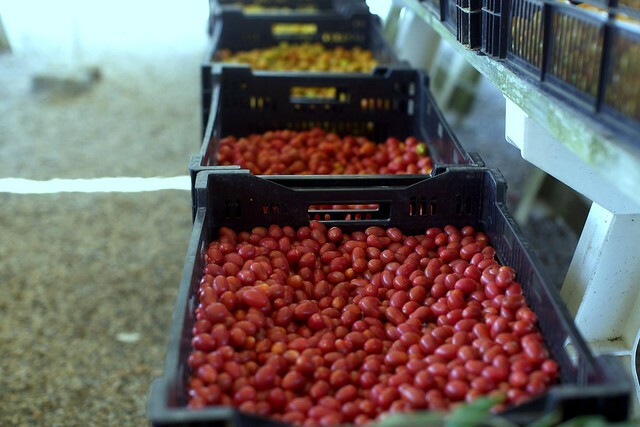 You put a tray or two of tomatoes in a bag, put the empty tray on the pile (don’t forget to replace the rock – the weight) and put your $$ in the can. And in my yard I see the occasional Bambi & every day Thumper & family dine on clover. Next vacation come to Kansas. No ocean, but there are lakes! I have been very studiously avoiding buying/reading that book. I have a block where overly popular things are concerned. I just can’t take it when people gush about something to the point where it seems to be everywhere. ugh. However, if you give it the thumbs up, I will reconsider. I will certainly be making a batch of these…with Stolichnaya Raspberry Vodka! Mmmm…summer in a glass. This sounds amazing. I’ve been on a bit of a raspberry kick recently, and raspberry lime rickeys are the definition of summer. OK, back from shopping and made us two of these wonderful beverages! Went totally adult and added Chambord! Wow! So easy to drink, will definetly used frosted glasses next time! Deb, I posted about it on my blog and linked to your blog and post! Thanx for the inspiration! I grew up in a small town with 3 (!) 7-11s, not some store named after the sound made by annoying Canadian water fowl. I was amazed at their lack of presence here in the general east coast/tri state area. I had friends in college whose blood ran Slurpee in the summer. Nice to know I can recreate them at home without all the nasty stuff in them….ponders stopping by the store for berries and limes tomorrow. This sounds lovely :-) And I’m glad you and your family are having such a wonderful vacation! Interestingly, I just finished that book and my sister bought it for a plane ride and several colleagues did the same. All of us were expecting not to like it purely because there was buzz, but darn it the title and idea are so interesting…and we were all pleasantly surprised. Perfect vacation reading. So, happy reading! Oh Deb! Squeals of excitement over here. I just happen to have raspberries and limes in the house together, for maybe the first time ever, and as soon as that darn ice freezes I’m whipping some up. It was meant to be, not to mention that I also have vodka in the house. Oh gee, what a good night we will have. Eat Pray Love was great. I didn’t want to read it because I don’t like to be on the same train as everyone else, but a friend lent it to me and I loved it. Can’t wait to see the movie. It took 4 of our limes to make one cup of juice. YUUUM! It is greatness in a cup! These were absolutely fantastic! All you could hear in my kitchen after I made them was the slurping of empty straws trying to get the very last drop. I too was a 7-11 regular. My poison was a coke slurpee. And a Skor bar. And sometimes beef jerky. Yikes. My dad used to take me and my brother to the park to the play Frisbee — then he’d drive all over town just to find the 7-11 with the pina colada flavor. Once, we went to five different stores. One of my favorite memories of my dad. And the raspberry-lime slushies?! On the list this week, absolutely! Thanks! I made these last night. They were sooooo delicious! Thanks for the recipe! Being from Texas, I love 7-11 Slurpees (particularly with this 100+ weather we’ve been having for the past month) and I love anything with lime! My grandmother and I still call them slime lushies (instead of lime slushies) Thanks for the recipe, can’t wait to try them and cool off a bit! I am all over these tomorrow! Ah…that book. I had kind of mixed feelings about it, but I hear the movie is good. I also enjoyed the part about the eating best. Made another batch of these tonight after going to the farmer’s market today. Used a mix of blackberries and raspberries with the lime juice. Made a beautiful dark purple colored drink. Delicious! Ms Pink, I fully agree – I hated the book! I love reading + always finish any book I’ve started, but that one – even with the foodie stuff, which is my other passion – just grated on me. I just couldn’t finish it. I live on a farm and have my own raspberry + blackberry bushes, and I have a lime tree and lots of lemon trees. Only problem is – it is still winter here and I can only file this as a “to do” when I have huge amounts of berries again. But Oh man, it sure sounds like my type of drink… with a slurp of something grownup, of course! I can only cry about references of blueberries, which is my absolute 100% favourite – I have not been able to grow it Boo-hoo!!!! Looks delicious, Deb!! I love that picture of the grapes..
By the way, which jars are those in the picture with the pressed limes? I love jars and canisters!! looks delish! where oh where did you get those little crates you’re always displaying stuff in? they.are.adorable. i feel like i must have them! I bought a natural slush this weekend that was delish in NYC… but then saw your post to make one at home and will try for sure! Posted a link on my blog to yours for others to enjoy ? Hi Deb! I love your site! It’s so professional and welcoming. However, when I clicked on this post today (the slushies look delicious, btw), I noticed that a rather irritating video started playing. I was shocked to learn that it was coming from your site! It is the video ad between the recipe and comments. I didn’t know if you were aware of this, or if you could possibly do anything to remove this video. I understand that you have to have ads on your site to make a profit (and I think you completely deserve it!) and are not in complete control of what ads are displayed, but I just wanted to let you know about this particular ad. I love your site too much to think that a newcomer may be turned off by an unfortunate distraction. Thanks for your attention and hope you can resolve this issue. LauraD — It is a Luminarc working glass. Eat, Pray, Love — I’ve decided what’s grating on me: those characters are way too polished. The exchanges are all so precious, they’ve clearly been heavily pruned and edited and something that would better back up the claim that this is a straightforward memoir is getting lost. Stephanie — Which ad was it? I would be happy to remove it. It’s just not showing for me. FWIW, I don’t load my site very often during the day (I work from the admin panel, even right now, leaving this comment) so I often don’t come across these annoying ads unless notified. Obviously, I don’t have any desire to irritate readers nor do I want loud or obtrusive ads on my site; I simply don’t know that these ads had slipped through. When I put ads on this site the first day I launched it in 2006, there weren’t a lot of video ads, pop-up ads and ads that clearly aim to be as reader-repellant as possible. Nowadays, this is the way almost every major brand fills ad space so it’s getting harder and harder to keep them at bay. Nevertheless, once I know the brand that’s serving it, it’s generally not hard to pluck it from the rotation. Are the tomatoes from Sand Lee Farms?? jeanne — Yup. Love that place. I have an enormous haul of them on my counter right now too and am swamped with possibilities. I made these slushies for girls-night-out this past Friday and they were a big hit! I did substitute the 1 cup of water for 1 cup of lime vodka and they were fabulous, but are you surprised? !…a little booze makes everything better! Thanks for the recipe Deb! Those were delicious. A great non-alcoholic option. Apparently it tastes a lot like a Sonic Cherry Limeade so my Oklahoma girls were excited about it too! Your website is amazing. Lindo! It was an ad for a new Butterfinger game The Good, the Bad, and the Candy on Facebook. Thanks for your quick response! Blender question for you: It’s time to buy a new one for me, and was wondering how you like this Cuisinart brand? Would you buy it again? Kelly — My blender is actually a blender/mini-prep food processor (this is the current model). I think it’s a brilliant product although it’s not especially amazing at either (you know, compared to a fancier model of either separately). It’s also great for small kitchens. I used the mini-prep for years before buying a full size food processor. My first thought was to add alcohol to these. Looks delicious and refreshing. Slushies were my treat to myself after getting off work in high school. Re: Eat Pray Love, the part after the eating was pretty tedious. She got pretty self-absorbed. But it is an entertaining read if you don’t want to get too intellectual on vacation. I remember your North Fork visit from last year – love that you’re giving my home town, Cutchogue, and the little towns around it the cred they deserve. This Saturday I’m heading there for my 10 year high school year reunion! Looking forward to old friends, empty beaches and lots of wine. *Fantastic* post! I love hearing you wax poetic about the joys of rural living in summertime. And it all builds up to…Se-Le (“say-lay” was how we referred to the local 7-11 in college). If it was up to me, I’d send you the Pulitzer Prize for this one. Oh, those look so good. Too bad it’s 70 and rainy here in Chicago. We’ll get another heat wave this year, I just have to count on it. And Slurpees are the most magical food ever invented. I get one every Friday afternoon on the way home from work. I’m pretty sure the only ingredients are artifical food colors, HFCS, water and MAGIC! Really easy, really good. Seeds weren’t a big deal, because they mostly sunk to the bottom of the glass. Thank you for this delicious recipe! I tried it last night with some girlfriends and we couldn’t drink it fast enough! And while I had to use frozen berry mix and part store bought lime juice, they were still heavenly! Wow! These sound and look delicious. I am making this in the immediate future. And adding this to my today’s fresh links for yummy, cool drinks. Thanks so much for sharing, My mouth is watering! 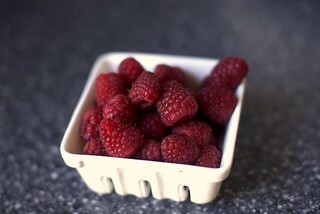 And here, I cry again, for the lack of raspberries in Bombay! This is a fantastic drink – I made it with fresh blackberries from my yard. But my boyfriend advanced to earth-shattering by adding a few fresh basil leaves. Great combination! I love your site and decided to take some time and visit tonight. I thought you might be amused to know that as I read down this page, I saw your comment on using your citrus press the wrong way. I was so confused that I decided to do some investigation… and found out I have been using mine wrong for two years. Yet another amazing thing I learned because of your website!! That raspberry slushy looks so delicious, and its sooooooo hot! in Miami, I’m definitely making this on the weekend. I hope you don’t mind if I alter it with a little alcohol as you suggested. Its been a long week and its only tuesday! @deb — I think you forgot the gin. I’ll just put in a lot. I made this last night for a friend who is pregnant and can’t enjoy the usual summer libations. It was fabulous! I will definitely be making it again!! I just made these & they were wonderful!!!!!!! Thanks SO much! Very yummy – perfect amount of tartness and sweetness. I liked it better without the splash of fizz. 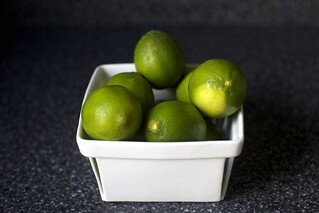 For a fun presentation, I rimmed the glasses with a lime zest-sugar combination and stuck a lime wedge on each glass. Totally, fun, easy, and refreshing. You can throw all ingredients into blender except the ice and just add ice and blend as guests arrive. Yum! I was just thinking about making my raspberry lemonade, maybe I’ll try it with lime this time – thanks! Made this today for the first time. It was delicious. Can’t wait to make it again, but I need more ice. Could you use simple syrup made with honey? Also, where were you??? You’d want to replace both the water and the sugar and it also might be hard to figure out exactly how much so just add the syrup to taste. We were in the North Fork on Long Island, still one of my favorite places.